There are a few smart people out there that have already gotten all of their Christmas shopping done. Then there are people like me that haven’t really even started. I always have a hard time choosing what to get people so I end up putting it off hoping the perfect gift will fall right in my lap. Once Black Friday hits, that is when I really start to get in present buying mode. When I’m out shopping and in the midst of the holiday craziness, I sometimes forget who I’ve bought presents for and who I still have left on my list. So I made a handy dandy printable that will solve all those problems. Unfortunately it doesn’t come with a little elf to help pick out the perfect gift. Have a happy Thanksgiving everybody and don’t forget your stretchy pants! Please read the Conditions of Use before downloading files from A Pair of Pears. I just wrote a list of everyone to buy presents for yesterday, but I like this list much better! It will be helpful to keep track of whose are bought, wrapped, ect. Thank you! This is so fun, cute, and practical! My favorite combo! Thanks! Thank you for sharing this. 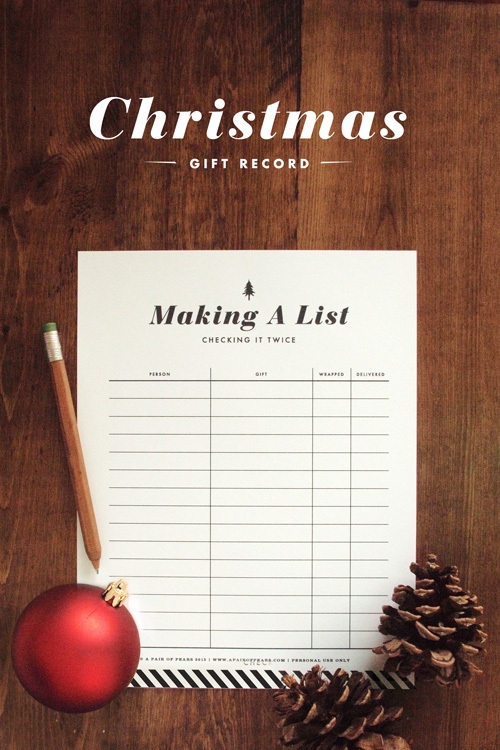 I am going to use a separate sheet to jot down ideas for each child, a sheet for each side of the family, and a sheet for all the rest: teachers, preachers, etc. Thank you! I love this. Just printed it twice! I can't believe it's that time of year already (i'm not complaining) 🙂 Happy shopping Tracey! This is great, thank you so much!! 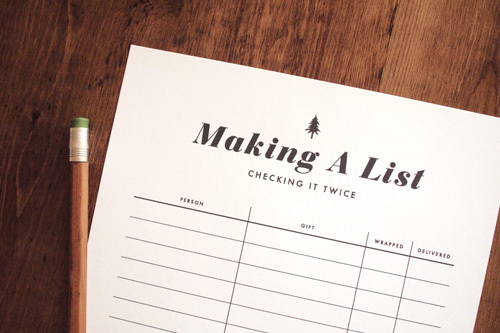 I am such a List person…Thanks for taking the time and effort of putting this together. LOVE IT! LOVE this tracker. So cute and functional. Thank you! Thank you for this gift list. I love that it is in black and white and so cute! Thanks again. Very cute list. Many thanks for sharing.